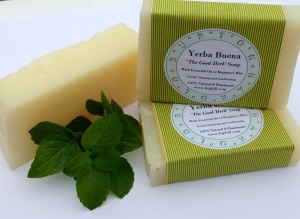 This variation of ‘Yerba Buena’ – I’m calling it ‘Yerba Buena M’ (M for Moisturising) adjusts the balance of oils from the original recipe and adds Shea Butter for it’s excellent skin nourishing properties. I countinue to make all my soaps Palm oil Free, Paraben Free and SLS Free, using 100% natural ingredients. I increased the percentage of Bergamot Mint Essential Oil in this batch because I love the smell and wanted more of it after the last batch. Each bar now contains just slightly below 2 grams of essential oil, and they smell amazing. Making this batch I experienced my first ‘Lye Volcano’ and it was a scary monster! I was being impatient and not waiting long enough for the camomile tea to cool before adding the lye – basically it was still quite hot – luckily I had the container standing in a deep sink. I was adding the lye fairly slowly (wearing gloves of course) and WOOSHHHHHHHHHHHHHHH! … it was quite impressive, and I good a good idea of how bad it could have been if it had not been in the stainless steel sink. So, it was back to square one, but lesson learned. As with any CP recipe, please be sure you understand the basics of safety – for example when handling lye! 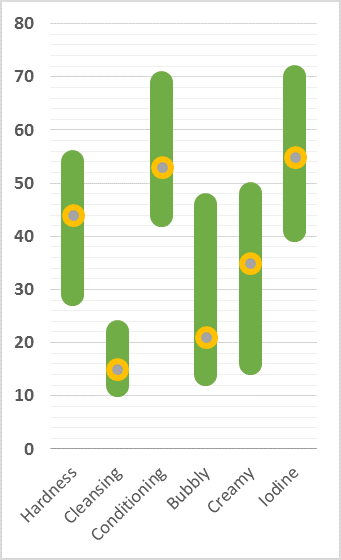 (see above)– and that you measure accurately, especially when making small batches of soap like this. I use an Ohaus Triple Beam Balance that allows me to measure accuarately to 1/10th of a gram, but a good digital balance is an equally wise investment. 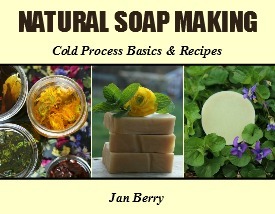 The Natural Soapmaking e-book – Jan Berry <- The best place to start! cold process soap, soap making. Bookmark.